Indoor cycling is ideal for getting fit and ProForm exercise bikes are budget priced so that anyone at any fitness level can afford to start on the road to good health. They have a wide range of models to choose from, and they're just packed with extras you don't typically find. ProForm is one of the brands owned by the large fitness equipment conglomerate, ICON Fitness, which also owns NordicTrack, Healthrider and Weslo. In the case of ProForm, larger isn’t necessarily better as this brand has some issues with quality control and the customer service is lacking. Both of those drawbacks can be easily corrected. The important point is that ProForm strives to provide good quality bikes with attractive features at prices the public can afford. ProForm has changed up the models quite a bit over the years, and fortunately the bikes seem to be getting better and better. The current lineup consists of the Pro Series, Studio Series, E Series and Hybrid Series. Let's take a look at the entire series to see how all of the ProForm exercise bikes compare. The only model in the Pro Series is the ProForm Cycle Trainer, one of the newest cardio machines in the lineup. It features a swiveling, front flywheel, 10" Smart HD console, commercial-gauge solid steel construction, iFit Coach programming, 22 resistance levels, 2 3 lb. dumbbells for arm workouts and plenty of adjustability. Here you have the Studio Bike and Studio Bike Pro, two of the most expensive cycles in the lineup. These bikes give you even more adjustability, more resistance levels, incline and decline capability as well as built in workout programs. They come with iFit Coach as well. ProForm consolidated their upright and recumbents to only one model of each. The 8.0 EX upright has a 5" backlit display, 30 built in workouts, 16 lb. flywheel, 25 resistance levels and a 300 lb. max weight capacity. The 440 ES recumbent has a 5" backlit display, 32 built in workouts, 18 lb. flywheel, 25 resistance levels and a 350 lb. max weight capacity. The up-level 14.0 EX and 740 ES are no longer available. This is a step up from the X-Trainer ProForm exercise bikes, giving you an elliptical and a recumbent bike combined in one machine. The base Hybrid Trainer features 16 magnetic resistance levels, 16 built in workouts, upper body arms, a 15" stride, 13 lb. 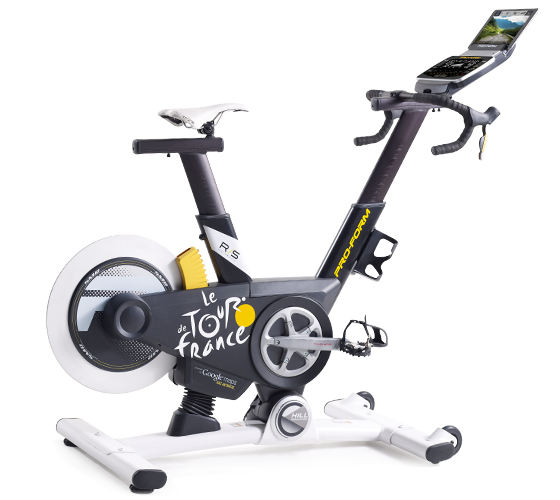 flywheel, adjustable seat and pedals, heart rate monitoring and a 350 lb. max weight capacity. The mid-level XT (may be discontinued) is nearly identical to the base Hybrid Trainer, but adds a larger tablet holder. The top-end Pro improves upon the base and XT models with 4 additional resistance levels, 4 more built in workouts, a larger 17" stride, cushioned pedals, a 15 lb. flywheel and a stronger warranty. This is the entry level series, featuring the most basic and least expensive models the company carries. The base X-bike features an upright frame, SpaceSaver design, 8 resistance levels, vertical seat adjustment, tablet holder, transport wheels and a 250 lb. max weight capacity. The up-level X-Bike Duo gives you everything the base model has plus the ability to make the seat recumbent as well, an additional 6 resistance levels, iFit Coach technology, 14 built in workouts, oversized seat and adjustable console, as well as a stronger warranty. The reviews on ProForm bikes are generally very good. Most of the bikes are so inexpensive that users are realistic in their expectations and give them kudos for the strong points, particularly the features on the entry-level recumbent and upright. ProForm exercise bikes are loaded with console features, adjustability for smaller and larger users for the right fit and comfort, and the right price. The company has made a name for themselves over the years as the go to brand for value and features, so you really can't go wrong with any of the exercise bikes you choose. ProForm Cycle Trainer - the newest exercise bike first introduced in 2019, an affordable studio cycle with a 10" touch screen display, iFit Coach on-demand workouts and 22 resistance levels. 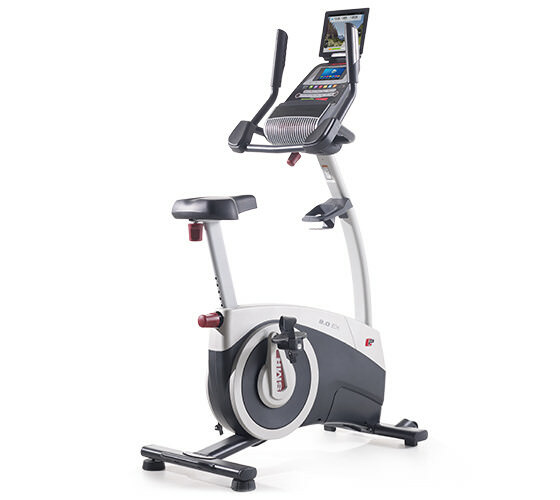 ProForm Studio Bike Pro - one of the newest models with incline capability plus a touch screen HD display with internet. ProForm TDF Pro 5.0 - part of the Road Series with automatic incline and decline and a 10" color touch screen. ProForm 8.0 EX Upright - iFit Coach workouts and training along with 30 built in workouts and 25 resistance levels. ProForm 440 ES Recumbent - the base model in the series featuring a basic, backlit display, plenty of workouts and iFit technology. ProForm Hybrid Trainer - An unusual cross trainer that combines a recumbent exercise bike with a fully functional elliptical trainer. ProForm 14.0 EX Upright - the upper level model with internet capability and tons of workout programs and resistance levels to choose from. ProForm 740 ES Recumbent - a feature-packed exercise bike with iFit, a 7" touchscreen with web browser, 26 resistance levels and comfort features. ProForm X-Bikes - Entry level bikes first introduced in 2017, including two affordable models under $300.